Written by Garth on April 6, 2015 . Last update on April 7, 2015. We know the recent uptick in mountain snow has been too little too late for many of you, but it has been enough to provide some nice skiing conditions in places and keep our daily forecasts going through the usual date of mid-April. The purpose of this blog post is to let you know our public forecast schedule for the remainder of the season. • The last daily mountain weather and avalanche forecasts on the NWAC website will be issued on Saturday, April 11th for coverage through the weekend. • Weekend mountain weather and avalanche forecasts on the NWAC website will be issued April 17th, 18th, 24th and 25th for weekend coverage. This format was implemented and popular last season. • As usual through the end of the season, we will issue Special Avalanche Advisories when unusually dangerous spring avalanche conditions are expected. • Continuing to provide weather forecast support for WSDOT avalanche staff monitoring the passes, including Washington and Chinook Passes. • Necessary improvements and repairs to NWAC weather stations. • Work on Phase 2 of the Mobile App and further improvements to the NWAC website. • Planning and preparing the NWAC budget and finances for the 2015-2016 season. • Producing an annual report and holding an annual meeting with our vested cooperators. We look forward to a new and much improved winter and providing forecasts for you next season! 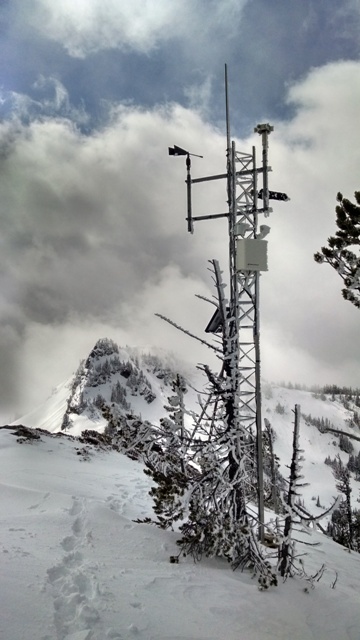 The Chinook Pass weather station on April 2nd on a visit by the WSDOT crew and the NWAC. Photo by NWAC forecaster Dennis D'Amico.